Thai Sweet and Spicy Cucumber Salad is my absolute favourite salad to make, especially when I am entertaining.In fact in my mind it’s an amazing appetizer not a mere salad. The dressing is the real bomb though and I think it would jazz up any kind of vegetable.It’s a Sweet,Spicy & tangy dressing- which is just what is needed to make the best salad dressing ever. It’s obviously Thai inspired as the name suggests.Traditionally fish sauce is also added in the dressing for an extra umami but I have skipped it in this dish. You can change the proportions of the ingredients as per your taste and preferences.This recipe will yield an extra spicy Thai Sweet and Spicy Cucumber Salad because of the chillies.If you do not prefer that much heat- use only one red chilli to make the dressing. This is a vegetarian Thai salad.As you can see I have not added fish sauce to it but to make the salad vegan- replace the honey with maple syrup or agave nectar. To make it Paleo & Whole 30 approved – Omit the honey & jaggery(palm Sugar) instead add some date syrup or chopped up dates.Replace the Soy sauce with Coconut Aminos. Most ingredients are pantry staples but ,if you can’t find Thai chillies use any normal red chillies available around you.Be sure to de seed it before using.Also, Please don’t rub your eyes after you cut the chillies like I did! The salad would work with any kind of cucumber- whether the desi large ones of the English cucumbers, but they should ideally be cold.One thing to note though is- The salad is best served immediately because with time the cucumbers will leave water and wilt a little bit, especially if they are cut thin.Thats why this salad is best served right away. If you love Thai food like I do, you must try making Thai Green Curry & uber easy Quick Raw Papaya Salad too. 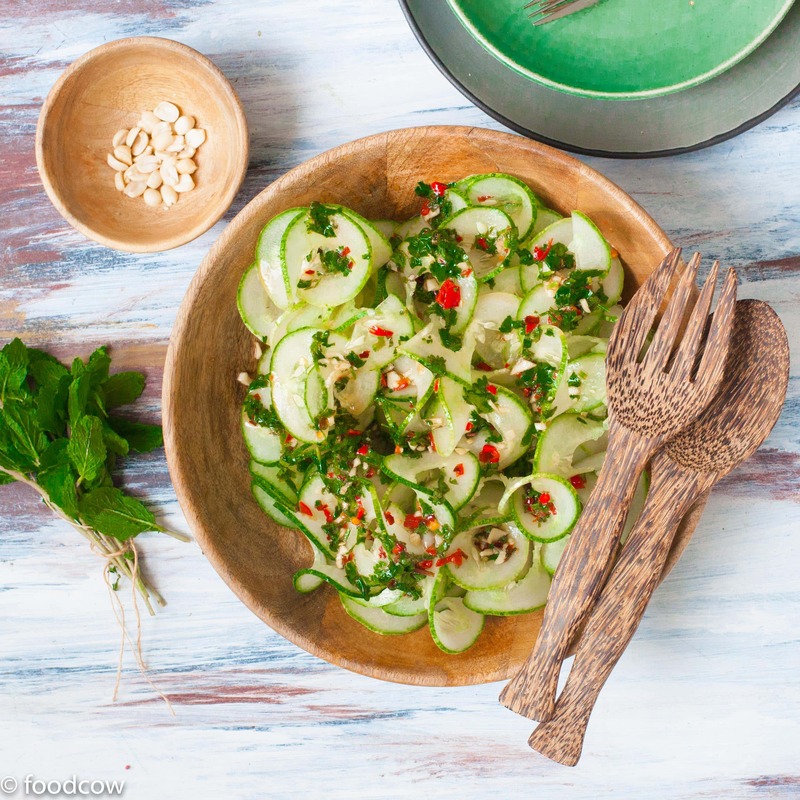 Thai Sweet and Spicy Cucumber Salad- Fresh Cucumber dressed with a Thai dressing made with Vinegar,Honey,Soy Sauce Coriander and Mint. Cut/Spiralize the Cucumbers.Cucumbers can be cut in any way you want- You can just slice them into roundels or chop them up into bite sized pieces or spiralize it like I did. Mix everything listed in the dressing.Season with salt. Pour it over prepared cucumbers. Mix it up and garnish with peanuts. Here are some more amazing Salads you will love!